Colonie- Helen M. Ryan, 90, passed peacefully on April 8, 2019. Helen was born May 17, 1928 in Glens Falls, New York, the daughter of the late Philomena and Joseph Sulette. She is predeceased by her devoted husband Francis “Bud” Ryan. Helen graduated from Plattsburgh University earning her BS degree in teaching. 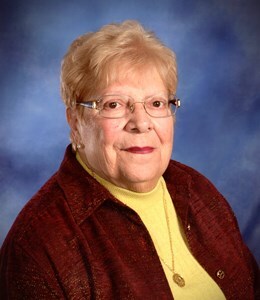 Helen was an elementary school teacher in the South Colonie School District until her retirement. She was a beloved teacher and instilled a love for learning in her students. Helen and Bud lived life to the fullest enjoying golf, curling, traveling, and spending time with friends and family. She was a member of the Western Turnpike Country Club and the Albany Curling Club for many years, and the Colonie Elks Lodge #2192. She participated in many charitable events at the Elks Club serving persons with cerebral palsy. Helen was very active in her residence community at Shaker Pointe in Watervliet enjoying all her friends and activities. Helen is survived by her sister, Lucy Sulette, son Timothy (Kathy) Stachnick, daughter Linda Stachnick, step daughter Toni Duffy (Mike) and many nieces, nephews, grandchildren and five great grandchildren. In lieu of flowers memorial contributions can be made to Community Hospice 315 S. Manning Blvd. Albany, New York 12208. A calling hour will be held on Sunday, April 14, 2019 from 12:00pm-1:00pm at New Comer Cremations & Funerals, 181 Troy Schenectady Road, Watervliet, New York 12189. A memorial service will follow starting at 1:00pm. Add your memories to the guest book of Helen Ryan. My condolences to the family of Helen Ryan. I was a fellow teacher in South Colonie and though I never taught with Helen, I met her soon after I started teaching because we bowled in the same league. She was always really perky and a lot of fun. I will never forget her laugh. Helen lived life to the fullest and she enjoyed it all. May she rest in peace after a life well lived. I have fond memories of teaching with Helen at Veeder Elementary & playing in a foursome with her after school. She was always willing to share good teaching ideas as well as how to improve your golf game. Watching curling during the Olympics reminded me that she & Bud were the only two curlers I knew. Sheila Y. It was such a pleasure knowing Helen. She had a unique gift of embracing life, her family and living in the moment. Our heartfelt condolences and prayers to all of you.